Creators of the top winning designs will stand to win one unit of the item they have designed. 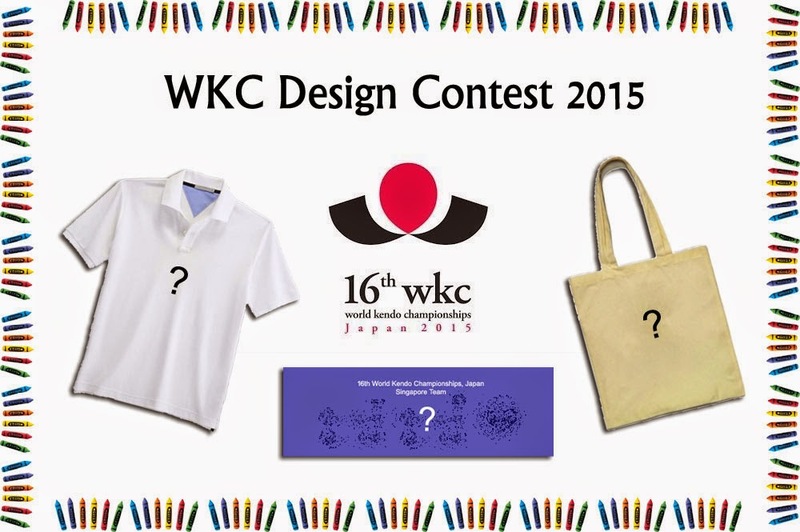 - "16th World Kendo Championships 2015, Japan"
• Must include one lower-resolution preview of the design (for initial submission), and the original design file for printing (to be submitted after announcement of winning designs). Can be submitted in both digital (.psd, .ai) or on paper (hand-drawn or printed) format. • Digital specifications: printable design must be at actual size, maximum size 14”x18”, 300dpi, and CMYK. • Design must be limited to 3 colours only, and not necessarily the base colours shown in the banner image above (i.e. Polo tee need not be white, tenugui is not necessarily blue). Unless necessary, please avoid using gradient colours in your design. Participation is not limited to members of the Singapore Kendo Club, but is open to anyone with an interest in supporting Team Singapore. However, should the winner(s) reside outside of Singapore, they will need to make their own arrangements for the prize(s) to be delivered to them. All submissions should be sent to us by 1st 8th February 2015, 1300h. Please submit your preview sample in .jpg, .jpeg or .png format. Please submit the original design file in .psd or .ai format. For design files above 10 MB please provide a download link via upload sites (e.g. Fileshare, YouSendIt, etc…). If you are unfamiliar with digital formats, we also welcome hand-drawn or printed submissions on paper. For examples of the products to be designed, please refer to the banner picture at the top of this post. All entries submitted for the Contest will be considered property of SKC without any compensation to the participant, and may be used, altered or distributed by SKC in any form or purpose. SKC reserves the right, at its sole discretion, to cancel, terminate, modify or suspend this Contest or these Official Rules without prior notice, and/or select the winners from the Entries received prior to the implementation of the disruptive action, or as otherwise deemed fair and appropriate by SKC Exco. Final products may vary from the display banner picture. ALL JUDGES' DECISIONS ARE FINAL. IF YOU DO NOT AGREE TO THE TERMS AND CONDITIONS OF THESE OFFICIAL RULES, PLEASE DO NOT ENTER THE CONTEST. * The information for pre-orders of the finalized products will be made known to you upon completion of this contest at a later date. Update (29th Jan): Amendments to the criteria are in italics.